By default the background color for all controls is set to the same value as the background color for the user form they exist on. These properties require a system color name or a hexadecimal color value to be set. 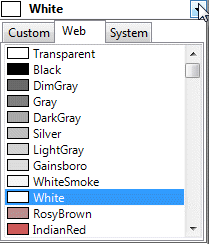 Select the required color from the list. Typing the Color name or Hexadecimal value. Type the name of the color or it's hexadecimal value directly into the property field. ColorHex(56,129,205,255) Changes the color of the control to be the hexadecimal equivalent of the RGB and Opacity values 56, 129, 205, 255. ColorHex(RedReturn, GreenReturn, BlueReturn, OpacityReturn) Changes the color of the control to be the hexadecimal equivalent of the RGB and Opacity values coming from the corresponding controls.